Ronald Reagan is the poster child of Republican ideals. There is no dearth of efforts these days to rename everything after him in memoriam, and if that movement continues, we may get to see his face on the fifty dollar bill. One could go deeper into his policies and how he shaped America in the 1980s to see if the hagiography is justified, but for now I'll just focus on a single element of the mythical folklore surrounding him. I’ll start by asserting that Reagan was a New Deal Democrat who opportunistically left the party to become a Republican. "I didn’t leave the Democratic Party. The party left me." - Ronald Reagan, August 1962. No, not many remember 1962 as exactly when Reagan became a Republican, but most are familiar with that quote. Over the years I have often looked at that with a combination of amusement and cynicism. That there are people who actually cite that as an escape-clause for Reagan's opportunism expecting others to accept that the Democratic party had transformed degenerated so much that it was not conservative enough for Reagan. Is that even possible? Let’s take a look. We'll start with the well-established fact that Reagan was born in 1911. A 2006 biography Ronald Reagan's Journey: Democrat to Republican notes that he was registered as a Democrat in 1932, at the age of 21. In 1962, the year by which the final straw broke his dromedarius-ian hump, he was 51 years of age, his affiliation as a Democrat had spanned a whopping three decades. So it stands to reason that a careful look at these thirty years should reveal when the Democratic Party purportedly left Reagan. Now, it could not have been when he joined the party, because, even if one were to dismiss it as youthful exuberance and lack of wisdom, Reagan must have found the Democratic party views rather similar to his to even join their ranks. History supports this, because Reagan did support FDR, not just in 1932, but for long after that. He voted for FDR all four times. “I was a New Deal Democrat.” - Ronald Reagan, 1982. That should effectively rule out the FDR era as the time when the Democratic Party left Reagan. It would be ridiculously disingenuous to claim otherwise. Of course, the fact that Reagan voted for FDR all four times still leaves the chance it was during FDR’s last term that the Democratic party left Reagan. This is not sustained by any evidence since FDR died in office in 1945, and no major policies could be seen enacted by the Democrats during the height of the Second World War. Republicans will enthusiastically tell you that FDR was a stark, raving liberal—the poster child for the Democratic Party. Yet history shows Reagan endorsed FDR and his policies wholeheartedly. One could point to the increases in the marginal tax-rates from the 1930s to 1945 when it peaked at 94 percent as the irrefutable evidence of the Democratic Party leaving Reagan. But a closer examination of the following years shatters this assumption. While FDR did preside over hikes in tax-rates to pay for the war, the rates were lowered in the following years to 82 percent and were held there till they shot back up to 91 percent at the end of the Truman years, and through Eisenhower’s presidency. We also know that Reagan endorsed Eisenhower. This is a strong indication that the tax rates under FDR were not the catalyst. That he endorsed Eisenhower would lead one to believe that the Democratic party’s alleged abandonment came between the end of FDR years and the start of Eisenhower’s presidency, even if we are to ignore that he did plead with Eisenhower to run as a Democrat. Was there a monumental shift in the policies of the Democratic Party in those years? History does not offer us any significant legislation or a seismic shift in priorities. There was the Taft Hartley Act, which resulted in a witch hunt for communists in unions, and a foot soldier for that was—you guessed it—Ronald Reagan. But was that when the Democratic party had left him? Seems really far-fetched that he would stick around for another 15 years if that was indeed the case. Or maybe the party left him in 1948, with the Dixiecrat faction that left the Democrats. That'd only indict Reagan as a segregationist, so obviously it is not the rabbit hole his ardent admirers would want to explore. Perhaps the change came right after Reagan supported the Senate candidacy of Helen Gahagan Douglas (Democrat) in 1950 against one Richard Nixon. Yes, the same Richard Nixon who would be Eisenhower’s running mate and Vice President a mere two years later. So, why does the myth prevail that Reagan stopped being a Democrat because of ideological changes in the Democratic party? Granted, the Democrats of the 1950s are different than the Democrats of later eras, as are the Republicans, but what changed between 1945 and 1952 that can be termed as an abandonment of principles, specifically those dear to Reagan? History provides us with sufficient evidence to reach a different conclusion. 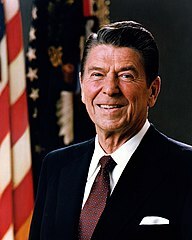 That Reagan left the Democratic Party because he could not advance his political ambitions in a crowded space that included the politically powerful dynasty of the Kennedys. That he found the Republicans more accepting of him as a leader that would provide him the necessary backing to reach meteoric heights politically. He did, after he abandoned whatever principles he followed or claimed to follow for a significant chunk of his career. When did the Democratic Party leave Reagan, or at least when did it start doing so? Just ballpark the year. What were the set of events that constitute this alleged desertion? Cite enough of them if it was not just a couple major ones. Is there any connection to the exodus of the Dixiecrats like Strom Thurmond from the Democratic Party beginning in the late 1940s? Given that the Dixiecrats were segregationists and Reagan was opposed to the Civil Rights Act in 1964.